George W. Bush: Build a culture of life. George W. Bush: Limit discretionary spending; cut 150 non-essential programs. Harry Reid: Bush�s deficit is a �birth tax� of $36,000 on every child. George W. Bush: Constitutional amendment to protect marriage. Nancy Pelosi: Defend civil liberties as we protect America. George W. Bush: Reward, not punish, the efforts and dreams of entrepreneurs. George W. Bush: Expand use of DNA evidence. George W. Bush: Increase the size of Pell grants. Harry Reid: World-class education to compete in world-wide economy. George W. Bush: Safe nuclear energy & less dependence on foreign energy. George W. Bush: Association health plans for small business. Harry Reid: Affordable healthcare makes America competitive. George W. Bush: For long-term peace, end conditions that feed radicalism. Nancy Pelosi: Our ports and infrastructure are still not secure. Nancy Pelosi: Greatest threat is unaccounted & unguarded WMD materials. Nancy Pelosi: G.I. Bill of Rights for the 21st century. George W. Bush: It�s time to permit temporary guest workers. Bobby Jindal: Supports Bush's proposal for personal retirement accounts. George W. Bush: FactCheck: System may pay less, but will not go bankrupt. George W. Bush: FactCheck: Private accounts are a good bet, not a sure thing. George W. Bush: FactCheck: Only SOME of your personal account is yours. George W. Bush: Social Security system is headed toward bankruptcy. George W. Bush: Personal retirement accounts for younger workers. Harry Reid: Bush�s plan guarantees a 40% benefit cut. George W. Bush: Taxpayer dollars must be spent wisely or not at all. George W. Bush: Re-examine the tax code from top to bottom. George W. Bush: Confront Iran as terrorism sponsor; hold Syria accountable. George W. Bush: $350M for Palestinian reforms. Nancy Pelosi: We cannot occupy Iraq indefinitely: We need an exit plan. George W. Bush: Appoints Laura Bush to lead anti-gang initiative. 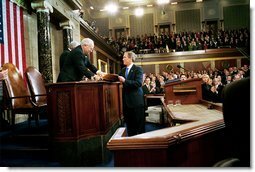 The above quotations are from State of the Union address to Joint Session of Congress, and the Democratic Response, Feb. 2, 2005.